The Secret Sun: Rent "The Box" this weekend. Seriously. 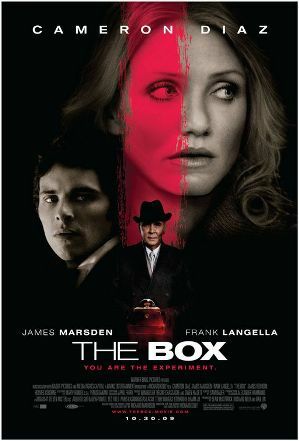 Rent "The Box" this weekend. Seriously. Once in a very great while, an artist comes out of nowhere and channels the most ineffably unconscious currents of an age into pop culture artifacts. Often it seems as if these artists are only half-aware of what it is they are channeling. Richard Kelly is one of these. Donnie Darko was one of those come-from-nowhere hits that tap into an unspoken mood not only in the nation's youth but the collective consciousness as a whole. Darko was released a few weeks after 9/11, and its themes of aircrashes and time paradoxes synched with some of the more esoteric interpretations of the event. Southland Tales was much less successful, but its failure was a result of reckless over-ambition, a bug that bites most young auteurs. But it too resonated with the mood of the country at the time, if not (quite) a bit more self-consciously. But one thing it had in common with Darko was its fringe science underpinings - mapping out a space where science and mysticism rejoin and tear away at the very fabric of consensus reality. Kind of a thruline there for Kelly, and his latest film The Box brings all of it into a much sharper focus than before. So I guess it shouldn't surprise anyone that Kelly's father worked for that most arcane of government agencies, NASA (known as "NAZCA NASA" around these parts). Or that he worked on that most hyper-resonant of projects, the Viking Mars Mission. Kelly draws upon that history in The Box, putting his male lead Arthur Lewis (played by James Marsden of X-Men fame) in his father's shoes, literally. The film is ostensibly based on an old Robert Bloch story but really isn't, outside of the basic premise. 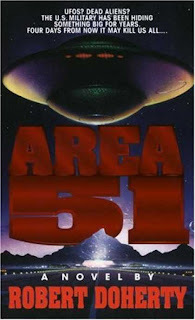 Kelly takes all of this into extremely esoteric territory, dealing with the hidden forces that govern our lives (lifting a major riff from the X-Files episode "Space," a brilliant story that got killed when Ten Thirteen started hitting the wall with money and schedules). Kelly also drenches every frame of The Box in a dream-reality ambiance that owes much more than a nod to David Lynch. There's not a lot more I can say without risking spoilage, so let's just say that The Box is a Synchromystic's delight, girded with fringe science and exopolitical undertones. The fringe science angle is especially fascinating - even though Kelly sets the film in his native Virginia, he filmed most of in the suburbs of Boston, including a few areas I have some connections to or have spent some time around. That's getting us close to Walter Bishop Country, for those of you keeping track at home. The locations turn out to be very appropriate, given the mind-bending subtext of the story. But there's an even deeper- and more disturbing- subtext to the story that has to do with the exact nature of the Frank Langella character and who he represents. And did I mention that the conceit of the film revolves around the old Arthur C. Clarke line about advanced technology being indistinguishable from magic? That's an endorsement in and of itself, right? UPDATE: Just a few miles down the road from Langely AFB (where much of the action in The Box takes place) comes this video in which a former New Hampshire Assemblyman claims that he was privy to information pertaining to a meeting between President Eisenhower and extraterrestrials. Is this a genuine whistleblower? A hoax? Some kind of viral marketing? Can't rightly say, but the sync is certainly quite tasty. NOTE: The video was released on Tuesday, nine days after I watched (and tweeted about) The Box. Speaking of syncs (and Air Force bases), this book literally dropped in my lap the other night in circumstances too complicated to explain. But I'm reading it now, being the obedient soul that I am. Predictably, it didn't waste any time taking me from Nellis (a form of Knowles, btw) AFB to the Giza plateau. Read all about it here.